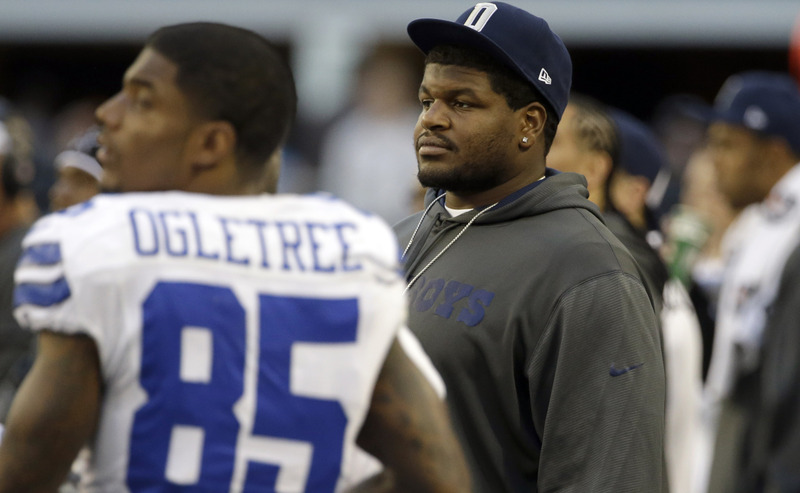 Cowboys nose tackle Josh Brent was on the sideline Sunday as Dallas beat Pittsburgh 27-24 in overtime - despite being charged with intoxication manslaughter in the one-car crash that killed teammate Jerry Brown. Apparently, that won't happen again, according to ESPN's Ed Werder, who reports that Brent has been barred from the sidelines for the rest of the season. Werder reports that neither the NFL nor the Cowboys were aware that Brent would join the team on the sideline, both the league and team believe it was inappropriate for him to be there. As CBSSports.com's Will Brinson notes, it's unclear whether head coach Jason Garrett knew Brent would be there, but Garrett did say that many players encouraged Brent to join the Cowboys on the sideline. "It becomes a real sensitive topic to a lot of people when you're in a public place like the game," Garrett said Monday. "There were no bad intentions other than to support Josh as part of our football team. This is a game and you need to be here. That's what our players wanted to convey to him and they really encouraged him to come to the game. I thought Josh handled it beautifully the way that he came and then when he felt like there were some issues he felt the right thing to do was to leave. "But we're going to support him in every way that we can. We also will be sensitive to this kind of issue." Meanwhile, a judge on Tuesday ordered Brent to wear an electronic monitor pending his trial. State District Judge Fred Tinsley also lowered Brent's bond from $500,000 to $100,000 on Tuesday. He ordered Brent not to drink alcohol or drive without a valid driver's license. Prosecutors say Brent was driving with a suspended license on the night of the Dec. 8 crash that killed friend and Cowboys practice squad member Jerry Brown. Brent will be required to wear a monitor to detect if he has had anything to drink. Dallas County District Attorney Craig Watkins said he agreed with Brent's attorney, George Milner, that the initial bond was set too high. "We want to treat everyone the same," Watkins said. "Just because he's a Cowboy doesn't mean his bond should be $500,000." Milner has protested about Brent's bond amount, which he said was higher because Brent "wears a star on his helmet." "It was off the charts, it was inappropriate," Milner said Tuesday. "And Mr. Brent should be treated like any other citizen of Dallas County." Brent appeared in court in a white dress shirt and jeans, with bandages covering his right hand. He did not answer questions from reporters after the hearing. Police say Brent was speeding when his vehicle struck a curb and flipped in the Dallas suburb of Irving. Brown was taken to a Dallas hospital, where he was pronounced dead. Brent was arrested and charged with intoxicated manslaughter, which carries a maximum sentence of 20 years in prison. A defendant with no prior felony convictions could be eligible for probation. Brent pleaded guilty three years ago to driving under the influence  a misdemeanor  while he was playing at Illinois. In the Illinois case, Brent was sentenced to 60 days in jail and two years of probation, according to court records. Brent has been placed on the NFL reserve/non-football illness list and won't play again this season. Heath Harris, the first assistant district attorney, said he expected Irving police to file a case against Brent with prosecutors this week. Prosecutors hope to present their case to a grand jury before the end of this year, Harris said.